Digital video converter x2VGA achieves the conversion of any digital TTL video signal to VGA. x2VGA converts old TTL video signals like MDA, Hercules, CGA, EGA or any industrial non- standard TTL video signal to VGA. The conversion is fully automated, however the user, through the graphic OSD operation menu, can change any parameter of the input video, like the sample clock and the vertical and horizontal active video pixels. This fine configuration permits to obtain a perfect quality of the output. x2VGA can be used to replace broken or malfunctioning TTL industrial monitors both monochromatic or color. Using x2VGA to replace industrial monitor is cheaper than repairing old exhausted monitor. 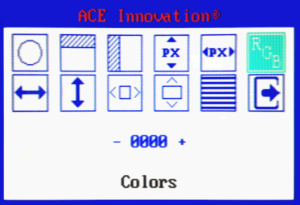 Thanks to the unique characteristic that let to dinamically change the pinout of the input connector, the x2VGA is able to convert perfectly the MDA, CGA and EGA with their full and original color palette. This is a perfect feature to use x2VGA as a video converter for graphic and games. Any parameter of the input and the output video can be manual set using the operational menu OSD of the x2VGA video converter. This allows, even with non-standard industrial TTL video formats, to configure the converter to get a high quality VGA signal.